The Kawasaki KE250B is a motorcycle produced by Kawasaki from 1977 to 1979. 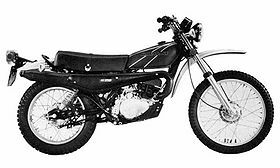 The Kawasaki KE250B was a 2-stroke, dual-purpose motorcycle manufactured by Kawasaki in the 1977-1979 production years. The KE250B was a piston inlet port 250cc which succeeded the Kawasaki F11 250. The KE250B had an electro-fused cylinder wall, CDI ignition system, and oil injection. Steering lock is combined with ignition switch. This page was last edited on 29 August 2010, at 16:55.